It’s that time of year again: it’s cool in the mornings, but still warm mid-day. 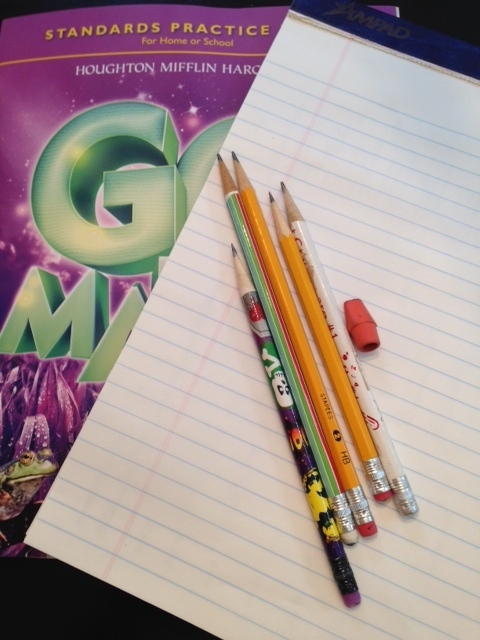 In my house, counters are covered with lunch containers, water bottles, new pink erasers, and sharpened pencils. For me, this means getting back to a more “normal” schedule now that my kids are back in school. Hopefully this schedule means more time for writing. I have just begun writing a new middle grade novel, and I want to keep the momentum going. I haven’t decided if the pumpkin spice lattes at my local coffee shop will be a motivator or a distraction, but I’ll guess I’ll have to try and find out. I’m not sure why, but I also find that back to school and the fall season are prime times to read. My son and I read quite a bit this summer, but there is something about fall that inspires me to dig into the long list (and pile) of books that I have been wanting to read. My son did not meet his goal of reading 20 chapter books this summer, but it was a good kick-start to a new summer tradition. We enjoyed reading together, and discovering new characters and worlds. I think the biggest accomplishment for the summer was when my husband asked my son if he wanted to watch a particular family movie, and my son responded, “but I want to read the book first!” Yay for reading! Aidan and I will continue to work our way through the chapter books on our list, which will be a nice compliment to the non-fiction books his teacher has already begun sending home. I hope you all had a lovely and relaxing summer, and will make time for reading (and writing?) as you ease into fall. How We Discovered This Book: This book was in the new books bin at our library, and it caught my eye. Rosie loves to create and invent things. She takes what other people would discard (broken toys, gears, etc.) and makes things. She tries to create solutions for people she knows, but it does not go well. Then her Aunt Rose stops by to give the right kind of encouragement just when Rosie is ready to give up. Both of my children are very mechanically-oriented, and they are fascinated with how things work. As I consider their education, I seek opportunities for them to expand their talents through science, technology, engineering, and mathematics (STEM) programs and activities. I also believe that girls need just as many opportunities to succeed in these fields as boys. This book showcases a girl who uses her creativity (and her apparent obsession with cheese) to make the world a better place with a few stumbles along the way. Additionally, there is an inference that Aunt Rose was a Rosie the Riveter-type trailblazer during WWII. The author includes a note at the end about this time in history. 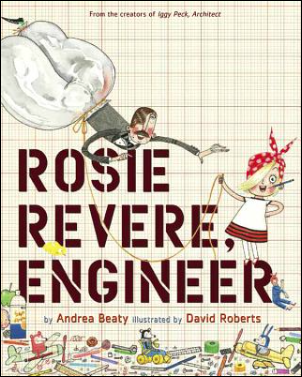 My kids liked Rosie’s persistence – she kept trying difference things until she figured out what worked. Elizabeth especially liked the silly parts – like when she made helium-inflated pants. Abrams Books has two whole pages of great activities related to this book. Check them out!